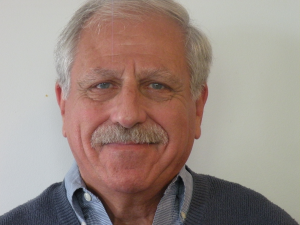 Since the mid-seventies, my interest in fine arts has continued to flourish. As a high school and college English teacher, I have integrated the art and literature of Inuit and Northern cultures into my curriculum and developed several classes that joined fine arts with English. For one project, high school students wrote their own myths, and using stone brought south from Canada, carved and displayed their own sculptures. Another project entitled, ”Listening with The Heart“ encouraged students to create original paintings that used the artistic technique of ”X ray vision,“ made famous by the First Peoples’ artist Norval Morriseau. I also gave a talk to fellow teachers on ”The Teacher as Shaman: Mythological Thinking in the Classroom.” By the time I was in the middle of my second decade of teaching, I finally realized that what most fueled my passion for Northern art was how the peoples of the North have relied upon and continue to use the powers of the imagination to survive in one of the most inhospitable places on the earth. 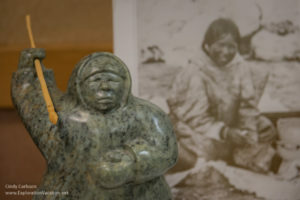 Although my collection of Inuit art runs the gambit of prints, drawings, sculpture, and artifacts, my area of greatest concentration is on the older, more primitive works done by the first generation of artists who made the transition from hunting to art when they left their nomadic lifestyles for settlements. In the art of these ”old masters,“ the mythological and spiritual realms are often depicted. I am beginning my fourth year as a member of the IAS as a newly elected board member, and I am looking forward to contributing to an expanding appreciation for this valuable and remarkable culture and the role that its art can play in keeping our imaginations alive, especially in our current world, where reason and technology are the dominate purveyors of our existence. My interest in Inuit art was kindled in 1983 while attending a chemistry conference in Waterloo, Ontario. The university there had a small gallery and I fell in love with a whale sculpture on display. Later that week the plenary lecturers at the conference presented the organizer with this same sculpture so I know it has a good home! In 1991 I married Thalia, a Canadian citizen, thus my trips to Canada became frequent and my exposure to Inuit art much broader. I learned many Canadian homes have a soapstone carving. We started small but after a couple of years another whale sculpture ”spoke to me“ and over the years our Inuit collection has grown to more than sixty mostly large carvings and several prints. These are juxtaposed to a somewhat smaller collection of Northwest Coast Indian art, and an eclectic collection of oil paintings as well as motorsports images which include two Inuit race car carvings. The IAS has been a wonderful find for us as we have been able to learn so much more about the culture and the art than we had been doing on our own. Meeting the artists who have presented at the annual meetings has been especially enriching. Inuit artists in our collection include: Nuna Parr, Kenojuak Ashevak, Ashevak Tunillie, Pitseolak Niviaqsi, Ohito Ashoona, Kellypalik Qimirpik, Lucassie Ikkidluak, Jaco Ishulutaq, Peter Sevoga, Lucy Tasseor, Tim Pitseolak, Noah Jaw, Eyeetsiak Peter, Jonasie Faber, David and Abraham Ruben, and Floyd Kuptana. The pieces were all selected for their ability to communicate with us and stir our emotions. They also do a wonderful job of helping Thalia feel connected to her homeland. We look forward to traveling to the arctic and experiencing the culture firsthand. 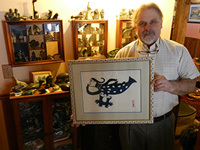 My wife, Kiki and I have been collecting Inuit art for more than twenty years. We bought our first carving in 1973 while visiting Jasper in the Canadian Rockies. It lived in solitary splendor until 1983. On a visit to the Stratford Festival in Ontario, we walked into a small cottage where a woman had set up a gallery showing Inuit and other indigenous art. We started talking with her, and were electrified by her enthusiasm and encyclopedic knowledge of Inuit art. Not surprisingly, we walked out with a piece. Today we have about 50 large pieces and more than a hundred smaller ones, taking up just about all the flat space in our apartment. They are set off by a number of prints we’ve had to have over the years; they take up just about all the wall space. The carvers include Nuna Parr, Kananginak, Barnabas, Saila Kipanek, Ralph Porter, Toonoo Sharkey, and Pitseolak, among others. Our print collection includes works by Kenojuak, Kananginak, and Germaine Arnaktauyok. Each piece has been selected because ”it speaks to us“. Joyce and I started collecting Inuit art in the 1980s with one small piece, two birds pegged to a base. I learned that when they faced each other, all was well, but when facing different directions, we needed to communicate better. Love of the art started a quest to see the land and meet the people. Over a decade we visited Baker Lake, Arviat, and Igloolik multiple times, and many other communities at least once. The trips included two Adventure Canada cruises, four canoe trips on some of the great Barren Grounds rivers of the central Inuit, and visits with families in their hamlet homes and in their tundra camps. We became friends with many Inuit, including some well-known artists. I am delighted to be able to share with like-minded people, and as a newer member of the Board, to working with the IAS to promote appreciation of the art, and the culture. As a North Carolinian, I hope to help represent the many fans of Inuit art who live outside of the upper Midwest base of the society. Like so many Inuit art collectors and aficionados, Kate and I began more or less by chance, in 1973. We were at a biomedical research meeting at Mont Tremblant; it was August, and the base area gift shop was open. We bought a cute little gray soapstone (it was around $ 10, and though cute, was really quite ordinary and undistinguished). But we were hooked! Now, 42 years later, our collection amounts to around 220 pieces of sculpture, nearly 100 prints, a weaving with skin inlays, and a rare hand-sewn sealskin intaglio depicting everyday events (igloo, dogsled, hunter, polar bear). We are traditionalists in our tastes, preferring “classic” period stonecut and stencil prints. Some of our favorite pieces are by Latcholassie, Miki, Tudlik, George Arluk, John Kavik, Jonas Faber, and Henry Evaluardjuk; and among our cherished prints are Sheouaks, Niviaksiaks, Parrs, and Kenojuaks. We now split our time between the NY State Finger Lakes (summers) and Santa Fe, NM (winters), and our collection is split roughly in proportion to the size of the 2 houses – ~ 1/3 in NY, and ~ 2/3 in NM. We strive to rotate the pieces on display at our Santa Fe house, but we’re lacking in discipline, so our favorites tend to stay out, while other pieces and prints are in storage mode. I’m delighted to be a part of the IAS and its Board, and I hope to help promote knowledge of, and appreciation for, the remarkable output ofthe talented artists of Nunavut. I have been collecting Inuit art since 1972 when a move to Maine gave me a chance to visit an Inuit art gallery in St. Andrews, New Brunswick. 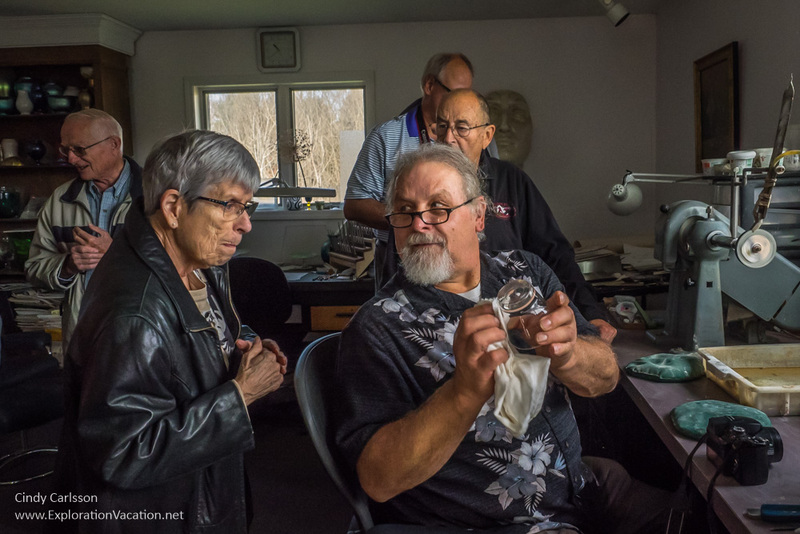 We have collected sculpture and prints and make regular trips to Sivertson Gallery’s Inuit art premieres in northern Minnesota. There my daughter and I had the opportunity to take a sculpture call from Ohito Ashoona. Our family’s interest [in Inuit art] is multi-generational – my father passed on some smaller sculptures to the family and several of my children share our interest. I work in the Minneapolis School District in a middle school and have a bachelor’s degree in anthropology with a focus on folklore. I am an addict. Yes, I have an affliction, but I come by it honestly. I love rocks !!! It seems that I have always been attracted to our North, to the Inuit people and their Art and I purchased my first sculpture in 1959, from the Vancouver Hudson’s Bay Co. using my own money saved up from baby sitting. That small seal from Belcher Island, now Sanikiluaq, is the cornerstone of my entire collection, because I still love the movement in the grain of the stone. I kept adding to my collection all through High School and University, but only with pieces that whispered to me. When People asked Gary and me what we wanted as a wedding gift, we said, “money toward an Inuit sculpture, please”. 3 sculptures were added after Feb. 3, 1969, as soon as we returned from our honeymoon. After we came back from living in Israel for 2 years, we had our 3 daughters in 3 years, and then I decided that I needed to change professions and pursue what I had always wanted to do. So, I went back to University and received a Masters in Arctic Anthropology specializing in material culture of Arctic Cultures, and cultural art. I did my fieldwork in East Greenland and Copenhagen. It is what people create within their cultural boundaries that I find beautiful, fascinating and thoroughly absorbing……this art talks to me and tells me stories and I become enriched by it. It was wonderful to finally become connected to the IAS, to meet the interesting people who are members, and to be able to see some of the fantastic collections that being a member of the society affords its members. It opens our eyes, our minds and our imaginations to see the incredible sculptures, prints and creations of the ‘old Masters’ and the newer ‘young artists’ – such creativity is seen nowhere else in such a small population yet is produced by so many as with the Inuit. It is so much fun to ‘talk shop’ with another individual who shares your passion and understanding, and I am sure that is why I enjoy the IAS meetings so thoroughly…….like people with like minds on like subjects !!! I do have a major collection of Greenland Tupilaq Figures, many from my late brother, Lorne Balshine’s collection, including 7 Aron Kleist, 2 Cecelia Kleist, 3 Axel Nuko, 3 Rassmus Singertat and 6 Gedeon Qeqe. My Canadian collection includes my favourites that are a Pauta Polar bear and a seal, a Barnabus musk ox, a Joe Talirunilli owl, a Lucy Tasseor Sedna, a Pootoogook Qiatsuq drummer, an Andy Miki animal, an Abe Anghik Ruben multi animals, a George Arluk drummer, a Jonas Faber owl, a Pitsiolak Niviaqsi mother and child, a Judas Ulullaq man with bow and arrow, and an owl, an unknown 1959 seal, an unknown 1968 Arctic hare, a Johnnie Inukpuk Arctic hare, an unknown 1961 owl and a Nelson Taqiraq girl with dog. I do have countless more sculptures, but I have only ever bought a sculpture because the stone was magnificent or the subject ’spoke to me’, or the carving was exquisitely executed. Inuit Art actually steals into my heart and my soul and I am captivated……I am addicted to it. Hopefully, I will be able to be of some help to the society, and I will bring my knowledge and service to the society to the best of my ability. I look forward to the next year. My introduction to Inuit culture began in 1976 and was a total accident. I had taken my children to Toronto for the weekend and the science museum was on the agenda. They had a live demonstration of an Inuit camp with men and women working on projects and throat singing. We left with two small soapstone carvings and the seed of an interest that world come to be an important part of my life. I found other soapstone pieces as I sailed (my other passion) the North Channel of Georgian Bay and other Canadian waters. This was followed by my discovery of the Dennos Museum in Traverse City. Now I had a regular source of Inuit sculpture. As fate would have it, my brother settled in Traverse City and the water there is dependably deep for my boat. What good reasons beyond a good source of Inuit art to retire to that community. So that is where I can be found. The next big event was reading about a meeting in Dearborn, MI of people interested in Inuit art. I was able to attend and the rest is history. I am a member of the Inuit Art Society and happy to have found like-minded souls who are touched by this art form. My first introduction to Inuit (then Eskimo) art occurred in 1971 when I was Director of the Center for Continuing Education at the University of Chicago. A gentleman named Earl Wadjyk, who owned an Eskimo Art Gallery in Madison, Wisconsin called The Great White Bear, approached me and asked whether he might rent some of our space to exhibit and sell some of his wares. Not knowing anything about Eskimo art, I found the idea intriguing and approved his request. A few months later he came for his first show and I was smitten, though I made only a couple small and rather tentative purchases: a head by Ovilu from Eskimo Point and a mother and child by Tuksweetok, also from Eskimo Point. Earl returned to our Center twice annually until 1981 and I started making more substantial purchases, both sculptures and prints. Additionally, my brother had moved to Saskatoon, Canada and my visits there exposed me to further temptation. I also found that the Department of Interior in Washington had a very nice shop where Inuit art could be bought – primarily from Alaska. With the founding of the Inuit Art Society, I became a more regular purchaser and have built a substantial collection of sculptures, prints and other Inuit artifacts. I’ve visited the IAF festival in Ottawa and recently visited Iqaluit. What is it that draws me to Inuit Art. It is part of my interest in folk art acquired while traveling in many parts of the world. I find that Inuit pieces particularly speak to me very directly. They create an intimacy which few other art forms do. I hope that the endearing quality of naiveté will not be lost as Inuk artists are exposed to more sophisticated forms of art.